We really do. Having been the exclusive U.S. importer for the Mercedes G.Wagen through 2001, we've had every question in the book thrown at us... and even a few that weren't in the book. Can I buy a new Gelaendewagen from Europa G.Wagen, LLC? We only sell pre-owned Gelaendewagens, however, many of our offerings are late models with very low mileage. Can I buy a convertible G.Wagen? Yes, G Cabriolets are our specialty, however, we also sell many long-wheelbase models. Why would I buy a G.Wagen? What ís the difference between it and other SUV vehicles? The G.Wagen is not only the most unique and exclusive off-road/personal use vehicle in the world, it is the only hand-built SUV available. Over-built in comparison to its competitors, the G is well known for its safety, durability and reliability. In addition to the superlative engineering and construction, the G owner enjoys a responsive and comfortable driving experience. 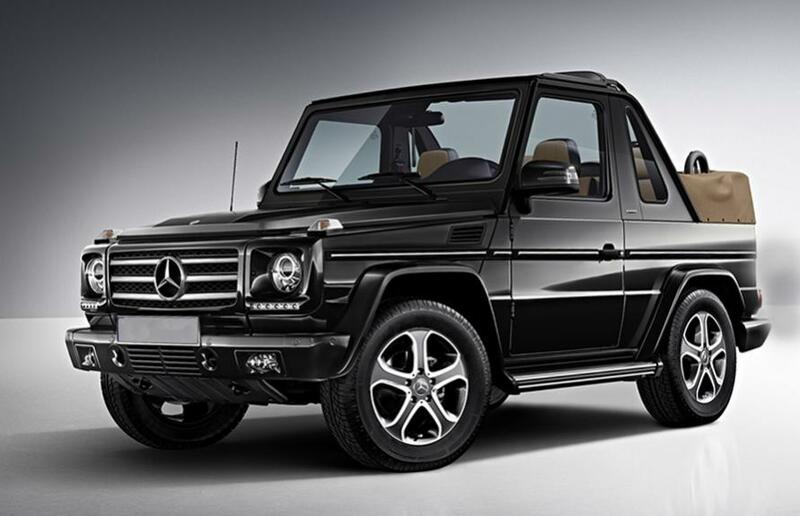 If I want to bring a G.Wagen to the U.S. from Europe, can Europa G.Wagen, LLC import it for me? We would be happy to discuss Gelaendewagen importation with you. We deal with these situations on a case-by-case basis, as importation is an extremely complicated, sometimes lengthy and expensive process. In light of the myriad regulations overseeing importation, the advice of a credible importer is critical to successful importation. Please call us. We can help you with your options. What is the passenger capacity of the Gelaendewagen? All Gelaendewagens are designed for generous and comfortable seating capacity for up to 5 adults. G.Wagen owners frequently mention the expansive head and shoulder clearance, which allows even the largest passenger a comfortable and safe ride. This unique clearance area also provides driver and passengers exceptionally superior visibility. What makes the G.Wagen so special? The G.Wagen is special for a number of reasons. First of all, the vehicle is hand-built in Graz, Austria. The production line averages a few G.Wagens per day and is hand-assembled. Next is the rugged build of the G. It is designed to last a million miles. Many of the components are able to be rebuilt and fully serviceable. The G.Wagen is almost unstoppable. With fully locking differentials (these were optional on early vehicles), a low center of gravity, a rugged ladder-style frame, and solid axles, you have to try to get the vehicle stuck. What models of G.Wagen have been available in the US and what are the differences? The G.Wagen has been available in a few different models. Gas and diesel engines were available up to 1986 (460 chassis). Gasoline versions, no diesels, were imported after 1990 (463 chassis). All years and engine series were available in Long Wheel Base (5 door), Short Wheel Base (3 Door) and Cabriolet (power soft-top starting in 1998). From 1979 to 1986 the G.Wagen was available in a more utilitarian style interior. The interior had cloth seats and rubber floor mats until the 1986 model year when carpet was optional for the floor covering. Many people upgraded the seats to leather and added comfort features like power windows and door locks. There were four choices of engines- Gasoline 2.3 liter (230 GE- 125 hp), 2.8 liter (280 GE- 150 hp), Diesel 2.4 liter (240 GD- 72 hp), 3.0 liter (300 GD- 88 hp). New government regulations stopped importation into the US between late 1986 and 1992. At this point, a new version (463 chassis) was being produced. The new version had many changes throughout the vehicle. A facelift was given to the front portion of the exterior and a new interior was created. The engine was upgraded to similar models offered in the passenger car. Only gasoline engine vehicles were imported into the US. The displacements of the engines grew from 3.0 liter (300 GE- 167 hp) to 3.2 liter (G 320- 210 hp), and finally to a 5.0 liter V8 (G 500- 296 hp). 1979-86 240 GD, 300 GD, 230 GE, and 280 GE.1990- 2001 300 GE, G 300, G 320, and G 500 (diesel were not available in the US due to emissions regulations)2002- present- MBUSA began importing the G 500 in the Long Wheel Base version only. What are the differential locks and how do I operate them? The differential locks are accessories on the G.Wagen that can be engaged to keep the wheels on the G.Wagen from spinning if one tire loses traction. What this means is the vehicle can go just about anywhere. In many off-road situations tires can lift off the ground when maneuvering over rough terrain. This is the point where most vehicles stop moving, but for the G.Wagen, it is an opportunity. By engaging one or more of the differential locks, the vehicle is able to proceed along the intended path with better control and less damage to the terrain. Operating them is fairly simple, but a few precautions need to be taken beginning with a low traction situation (dirt or ice, but never on pavement). The locks must be engaged at a very slow speed (i.e. walking pace) or major damage can occur. The locks must not be applied when driving on the public roadways. Having any of the locks engaged will cause the vehicle to handle differently and could create an unsafe situation. On a side note, the later models can only be selected in the sequence listed below. The first lock able to be engaged is the center lock. On the early vehicles (460 chassis- up to 1989), this is as simple as putting the Transfer Case in 4 high or 4 low. On the later vehicles (463 chassis- from 1990), press the center lock button located on the dashboard (the amber light shows that it has been selected, the red light indicates the lock is engaged). This equally distributes power between the front and rear axles. If the vehicle were still in a tough situation, proceed with the application of the rear lock. This is achieved by lifting the rear knob on the console on the earlier G.Wagen or by pressing the bottom lock button on the later models. The rear axle is now locked and there will be no slip of the differential. Finally, in the most difficult terrain, apply the front lock. This is done on the earlier model by lifting the front knob or by pressing the top lock button on the later models. This final step will create the most traction by locking the front axle. Now all four wheels have equal power and all the vehicle will need is one tire with grip to pull itself out. Caution: When the front lock is engaged the steering will be greatly effected. Pushing the lever down on the earlier models or pressing the button on the later models can deselect the differential locks. The red engagement light may stay illuminated for a short period. This is normal and will go out in a short distance of travel (moving the steering wheel back and forth can help it disengage). Do not drive on pavement if the light is on or serious damage could occur. How do I operate the Transfer Case (knob at the back of the console)? The Transfer Case is a drivetrain component. It’s main job is to allow the driver to easily change final drive gearing for the varying road conditions. This puts less stress on the driver and vehicle. In a real world situation, select a lower gearing to pull a boat out of a lake or when climbing a steep mountainous dirt road. By shifting the transfer case to low, the driver can feel confidant about pulling the boat from the water or climbing a mountain. On the early vehicles (460 chassis- to 1989), there are four selections for shifting the transfer case. The shifting must take place when the vehicle is at a standstill. The only exception is if you are shifting in between 4 high and 2 high, which can be done at speeds up to 35 mph. The later versions (463 chassis- from 1990) have three selections on shifting the transfer case. Vehicles up to and including 2001 have a shifter on the console. Later versions have a switch on the console to shift the transfer case. All of the later versions are full time four-wheel drive. Note: When either vehicle is in Low Range it is important to pay close attention to the vehicle’s engine speed. Because the gearing has changed, the engine will rev faster and reach its limits sooner. The top road speed of the vehicle will be half of what it is in High range. What are some things I can do to keep my G.Wagen in good shape? The most important part to ensuring a long healthy life of your G.Wagen is proper maintenance at the scheduled intervals. The proper schedule is located in the Maintenance Booklet included in the ownerís manual pack. If you have lost the book, please contact our parts department for a replacement book. Another resource for your G.Wagen library is the Maintenance Manual. It is a book that shows how to perform all of the regular maintenance jobs on the G.Wagen. Included in the book are detailed instructions and pictures, plus useful torque specifications and fluid capacities. In addition to regular maintenance, there are some things that need to be performed on a monthly basis to keep the vehicle is good operating order. Every month the differential locks, air conditioning, auxiliary heater, and each transfer case selection need to be exercised. This can be as simple as finding a short dirt road to drive while operating each component. The differential locks will engage more easily if you move the steering wheel to the left and right. Once the front lock has engaged, avoid making sharp turns and never drive on the pavement with any of the differential locks engaged. I’m looking to purchase a G.Wagen, what should I look for? As with any vehicle, there are certain items to be cautious of before purchasing a G.Wagen. Listed below are some things to be careful of. — Look for rust under the taillights, fuel pedal area, and rocker moldings. The earlier vehicles were more susceptible to having these problem areas. We suggest taking the drivers floor mat and rocker moldings off to see if there is any rust. — Drive the vehicle at highway speeds and feel for vibrations. The older vehicles are more prone to have vibrations at highway speeds; but small amounts of vibration are to be expected. The vibrations are normally caused by driveshaft imbalance or wear in one of the vehicleís three driveshafts. The solution is normally driveshaft replacement. — If the G.Wagen is a ìlow mileageî vehicle, be curious. The early vehicleís odometer only counts up to 99,999. So look over the interior and exterior for wear. It could have turned 100,000 miles and then some. — Have a reputable shop do a general inspection of the vehicle. Have a compression test, under vehicle inspection, and test drive performed. The money spent on the inspection can save thousands later. — Many shops have not experienced the differential locks or transfer case of the G.Wagen. Please print the operating instructions (they are listed on this site) and have them, or yourself, operate them to ensure that they are functional. — You can also call us. We may be able to provide some history on specific vehicles. Can I tow my G.Wagen behind my RV? The Gwagen cannot be towed behind a RV without some changes. We always suggest having the vehicle loaded on a trailer if it is going to be transported for any distance. If you have to tow it and cannot load it onto the trailer, the front and rear driveshafts must be removed, the vehicle must be towed in the normal driving position and all four wheels must be on the road. The transmission needs to be put in ìPî or ìGLî (depending on year). Please see the ownerís manual for more information. Who can service my G.Wagen and where is a good place to get some G.Wagen tips? Call us and we can refer you to G.Wagen shops in your area. What should I do if my G does not start? The first thing to do is check all of the basics. Is the vehicle in Park? Is there fuel in the fuel tank (at least 5 gallons if it ran empty)? Do the dash lights come on? Are all of the fuses in order? Are there any puddles under the vehicle? We recommend always try cycling the key and alarm a few times. (If the remote does not work it may need new batteries.) Go to the vehicle’s battery and check for loose connections. Be cautious if there is any clear watery solution around the battery area as it could be battery acid, which is highly corrosive. If all of those items check out, it is time to have it taken to your local service point. Note: Because of all of the onboard electronics on the vehicles since 1990, it is dangerous to jump-start or be jump-started. A voltage spike could occur and damage a control unit. The best thing to do is remove the battery terminals and slow charge the battery. I own a G 500. How does the vehicle tell me when to perform a service and should I trust it? Beginning with the US model year 1999, the G 500s came with the Flexible Service System that informs the driver of when the next service is due. The vehicle’s instrument cluster will display a message when the service is due about a month before the service is needed. Sometimes the display will tell you how many days are left, and other times it will let you know how many miles remain. It is very simple to use. As for the reliability of the system, we trust it. It is very complex in how it determines when the oil should be changed. Measuring oil quality as well as how the vehicle was driven, it can make a precise determination as to when the vehicle needs to have the oil changed. Where can I go to purchase G.Wagen parts and technical information? How about service tips? Europa G.Wagen, LLC can take care of all of your parts and technical information needs. We have a large supply of G.Wagen parts and manuals for all models of the G.Wagen, and can also provide technical support. We have been specializing in the G.Wagen since 1983, and our extensive knowledge and understanding of the G.Wagen is second to none.